While the board game side of things has almost exclusively been Alex’s domain on the site for a long while, due to a significant amount of changes that have come into my life as of late, I’ve begun exploring the idea of getting into the hobby myself a bit. While I’m absolutely not the sort of person who’s going to jump in and start painting figures for days on end (for a variety of reasons), I am the sort of person who’d be interested in backing something ridiculous on Kickstarter because it looked cool, especially if it happens to fall in line with my normal interests. 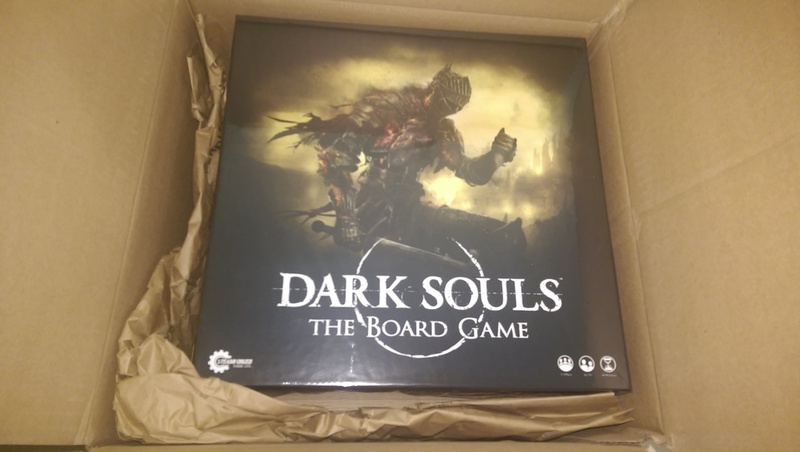 As you might imagine, with that in mind, a board game based on Dark Souls would fit exactly into that particular wheelhouse, so when the Kickstarter from Steamforged Games came up last year, I jumped right in as a backer with a smile on my face. 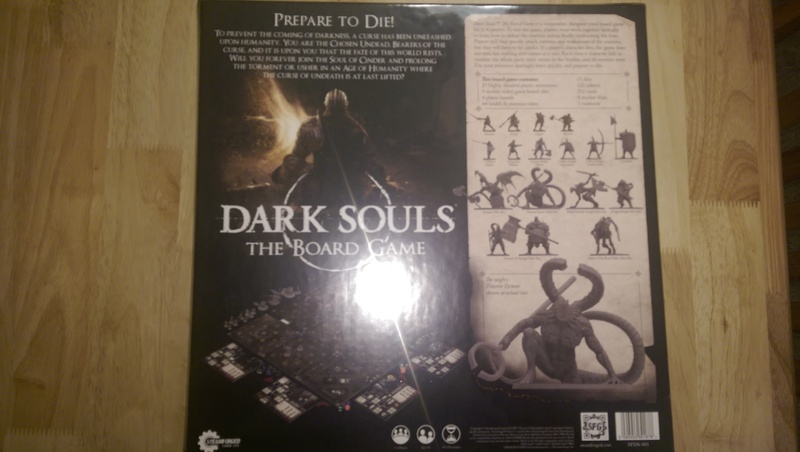 Well, the first wave of the releases for the Dark Souls board game have been completed and shipped to backers, and I just received my copy of the core game, so I thought it would be fun to unbox it and show everyone what comes in the package, in case you were interested in picking it up when it hits retail. 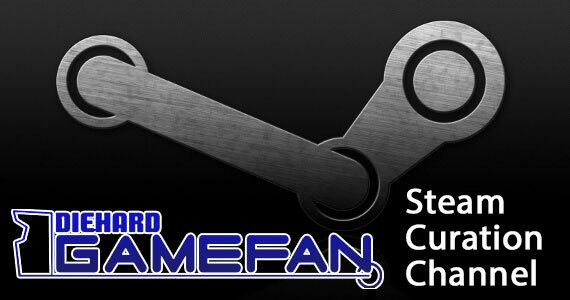 It should be noted, this is only the core game; none of the expansion content has been released as of yet, though when it does come around, I’ll be back here to showcase what all comes in the packages for your viewing pleasure. With that all in mind, let’s get started. The outside of the box the package came in, in the cardboard box received in shipping. Nothing too fancy here, obviously. 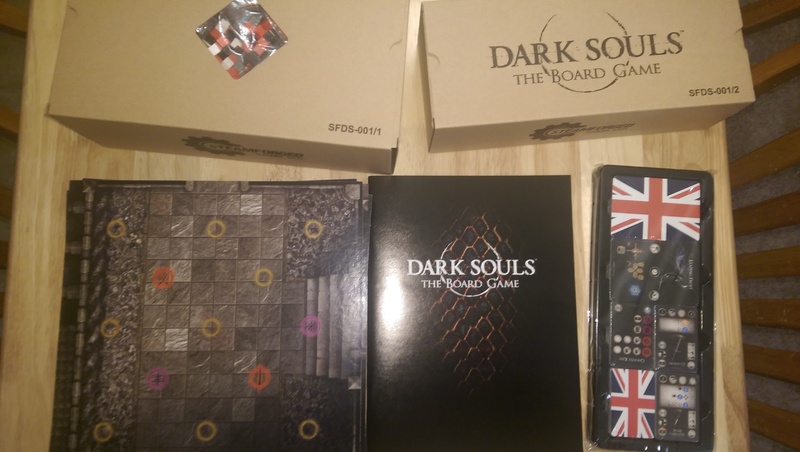 A more direct shot of the box, removed from the shipping package. It’s a pretty hefty box, in terms of size and weight; while it’s certainly not the largest board game I’ve ordered to this point, it’s in the top five, and as you’ll see, there’s a lot of content in here to justify that size. A shot of the back of the box, which showcases what comes in the box as well as the flavor text meant to sell you on paying your hard earned cash for it. 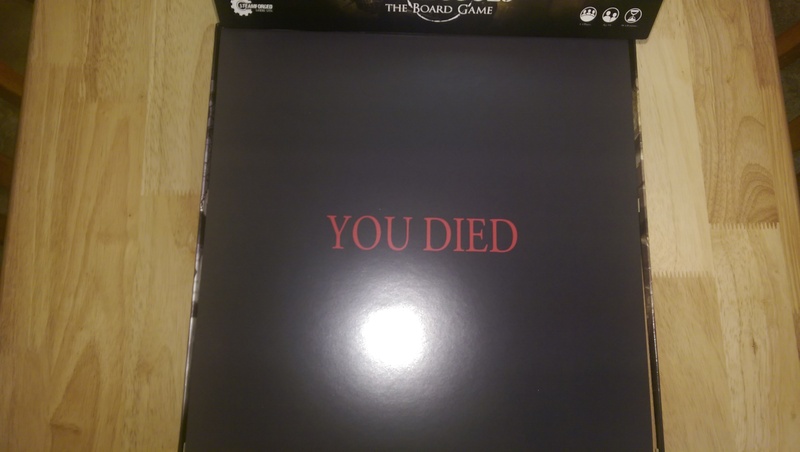 If you’ve seen this on social media, you might have thought it was a random joke, but no, this is seriously a thing: when you open the box, there’s a cover sheet inside that proclaims “You Died” upon opening the box. It’s cute, I’ll give it that. The content inside of the box, before removal. which are all pretty self-explanatory. I’ll go into detail on each in a second, but one thing I do want to note here is that everything packs back up neatly into the relevant boxes once you’re done playing, more or less; the only things that need to be left loose once you’re done unpacking everything are the punch tokens, which can neatly be sifted to one side of the box. It’s a fairly easy game to unpack and re-pack for play, in other words, so you won’t find yourself fighting too hard to get everything set up and packed up. 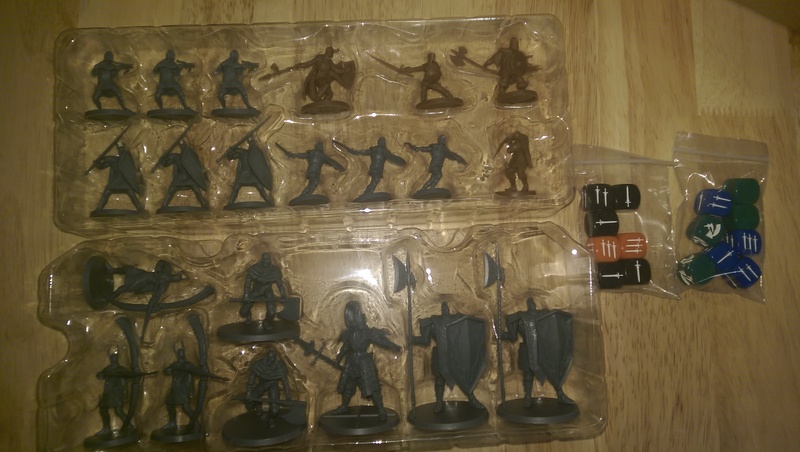 A shot of the contents of the larger box, including the six larger figures and the chits you’ll use for play. The chits come in white, red and black, and are used to track character levels, health and stamina, respectively, and there are plenty here to use as needed if you want to fill in the punch marks for four players, so you shouldn’t have an issue even when playing with a full house. 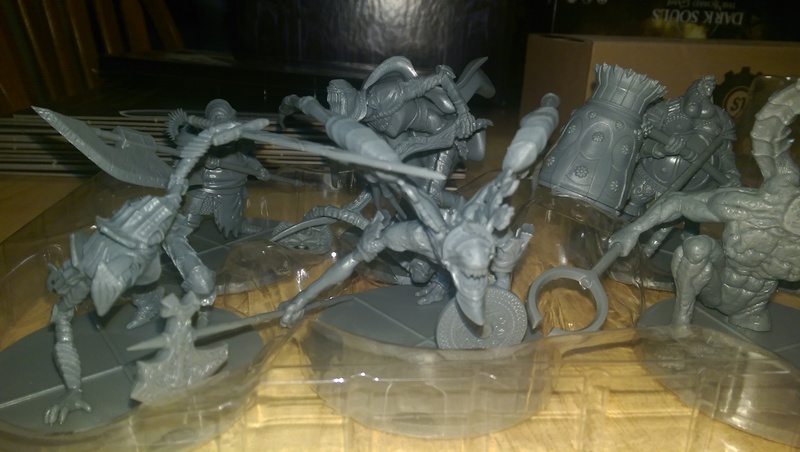 A close-up shot of the larger figures in their plastic holder. 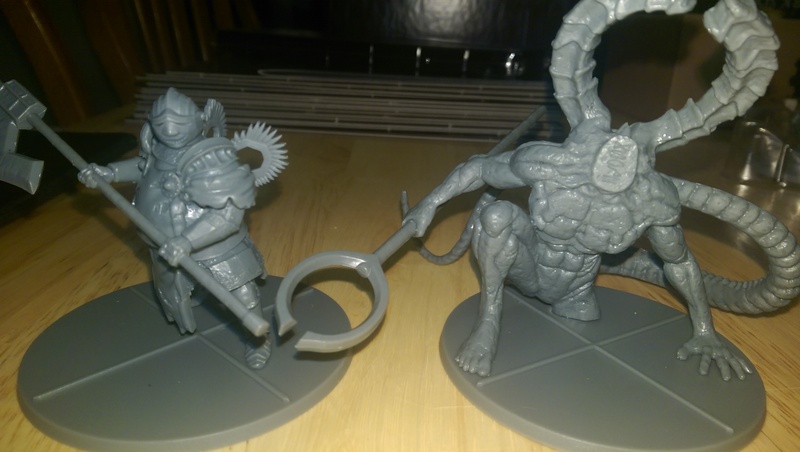 These are the figures for the Winged Knight and the Titanite Demon, up close. These are instantly recognizable for fans of Dark Souls and Dark Souls 3, as they look really amazing, especially if you’re into heavy detail on your units. 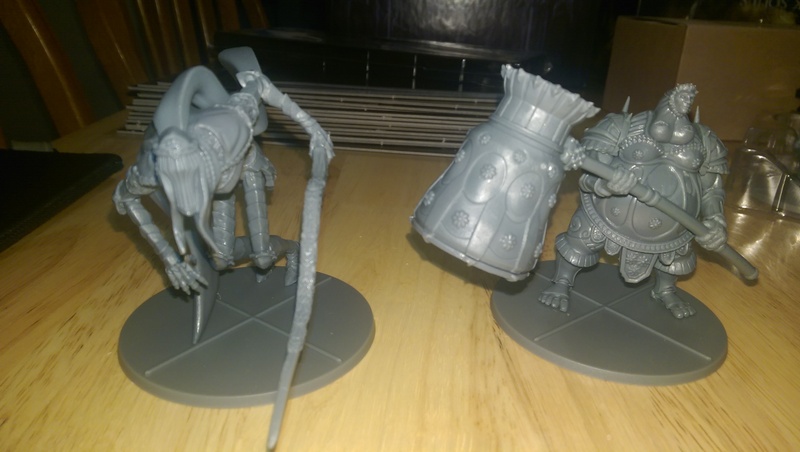 These are the figures for the Dancer of the Boreal Valley and Smough, up close. Again, instantly recognizable for Dark Souls and Dark Souls 3 fans, and while there are some mild bends in the plastic from packing and shipping, everything still looks great. 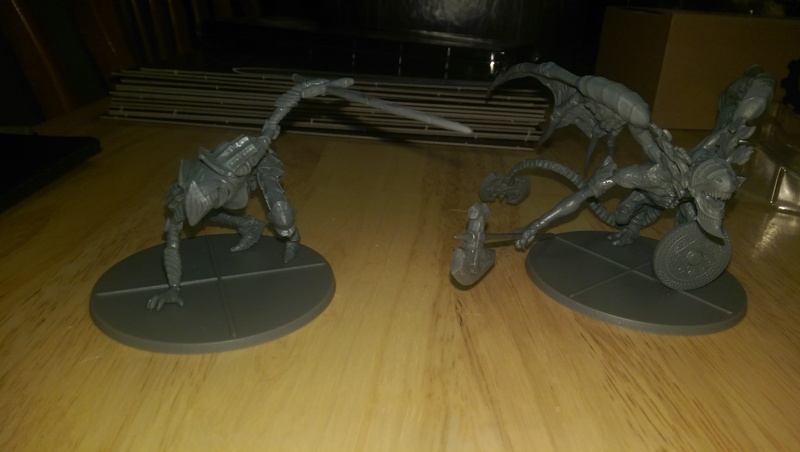 These are the figures for the Boreal Outrider Knight and the Bell Gargoyle, up close. 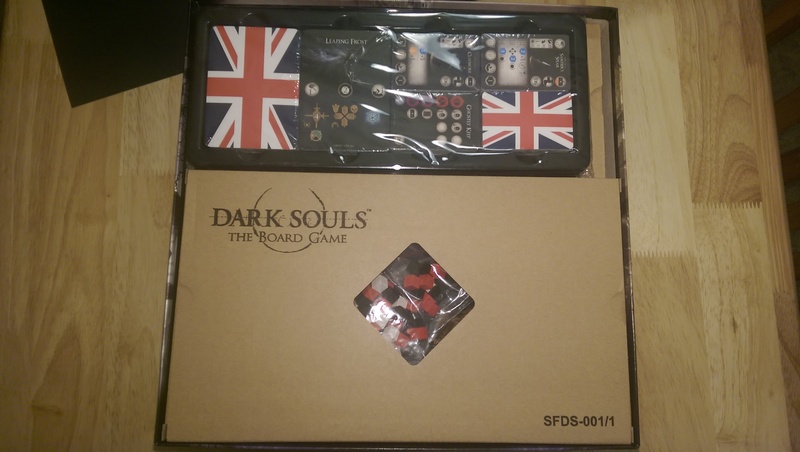 For those who have noticed that the core package is decidedly Dark Souls and Dark Souls 3 heavy, this is decidedly the case, but don’t worry, Steamforged has you covered. A Core Expansion is coming later this year (I believe) which contains The Pursuer and Sir Alonne, and several more Dark Souls 2 themed sets are coming, including bosses like the Smelter Demon, the Guardian Dragon, the Old Iron King and more, so worry not, you’ll have plenty of options ahead. 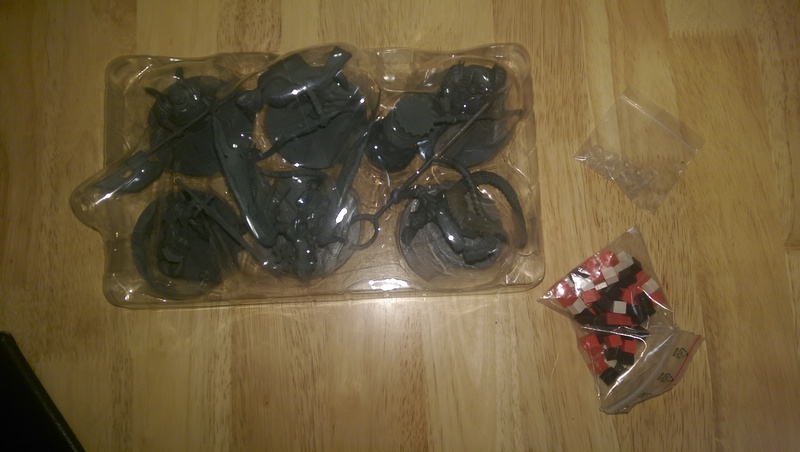 These are the smaller figures, unpacked from their box, along with the two dice packs they come packed with. 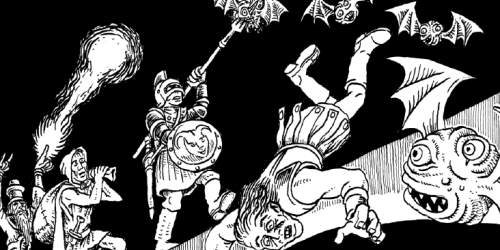 The dice are used for various combat rolls (which are explained in the manual), and the various figures here are mostly grunt enemies you’ll see during normal play. 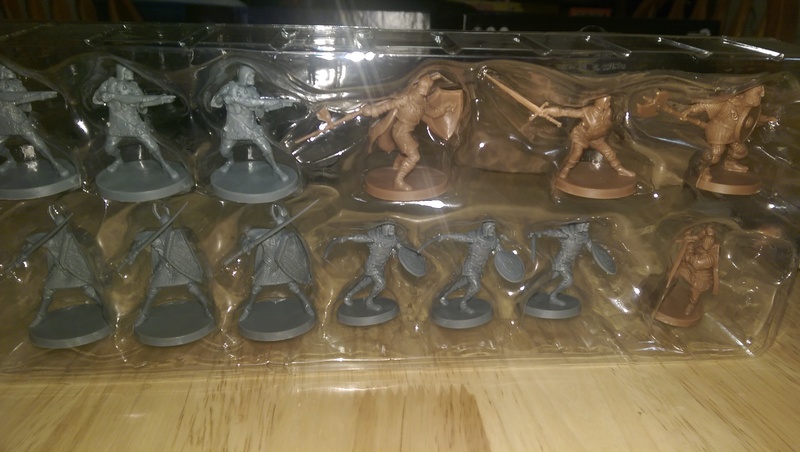 A closer look at the larger package of small figures. As you can see, what’s here is a straight mix of Dark Souls and Dark Souls 3 grunts, though steely-eyed fans will note Ornstein in the middle there; as you’d expect, he pairs with Smough as one large boss battle. 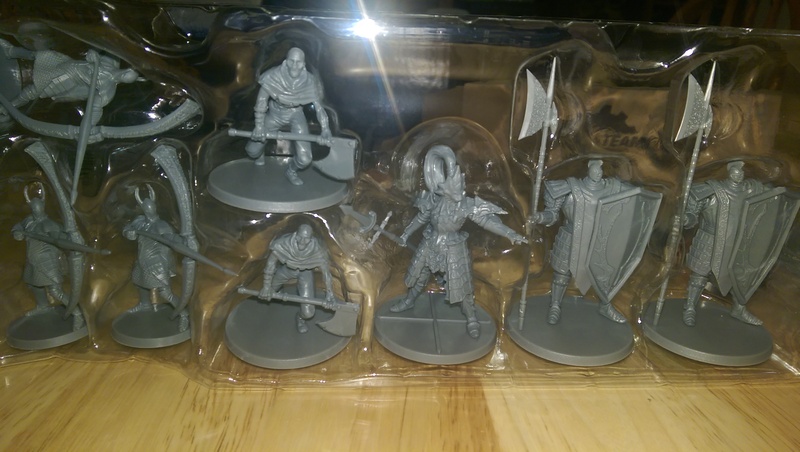 A closer look at the smaller package of small figures. The brown figures are used as the playable character figures, making it easy to tell them apart from the grey enemy figures for those who aren’t inclined to paint their figures. The backs of the six card packages you receive in the box. There are a few different decks you’ll see in play in Dark Souls, and the varied backs make it easy to sort things out into their relevant decks. The larger cards include behavior cards for all of the enemies in the game (both grunts and bosses), as well as small combat AI decks for the bosses to randomize their behavior as needed. 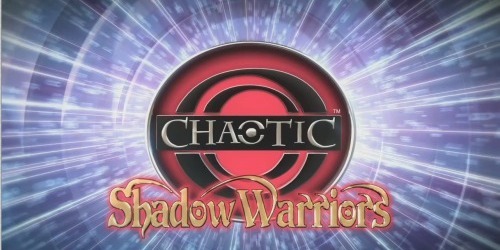 The smaller cards represent equipment almost exclusively; the ones with the treasure chests on them are part of a treasure deck that’s shuffled up to provide random payouts during play, while the more distinct backs are meant to represent equipment that the characters start with, so you can easily identify them as needed. Another shot of the cards with some of the faces visible. 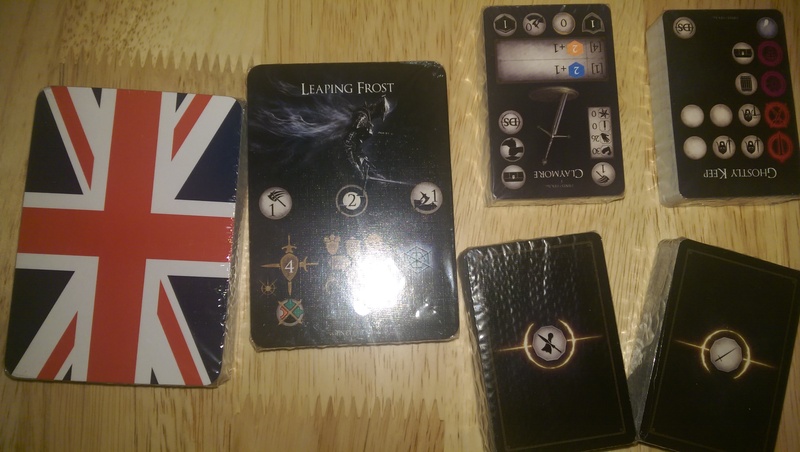 To answer the obvious question, the cards with the UK flag on them appear to be placeholders; they don’t have backings and mostly seem disposable since they have no apparent relevant text with them. 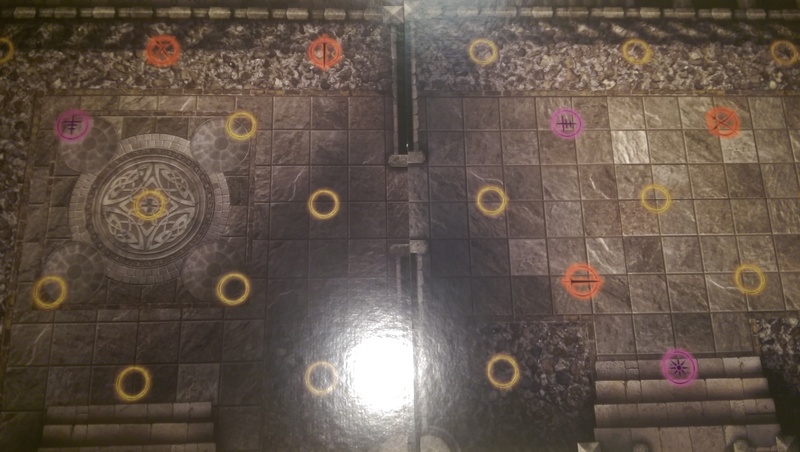 These are the map tiles that come with the game. You’re given nine tiles, of which one is a bonfire tile, one is a mini-boss tile, one is a main boss tile, and six are normal tiles that you shuffle up and place as your game board as needed. The tiles are fairly sturdy and seem like they could hold up for many sessions of play, and each has two sides to it so you can set up two different sessions of play dependent upon what you’re aiming to do. Finally, these are the punch cards that come with the game, which include various punch out tokens and character sheets for token and card placement. 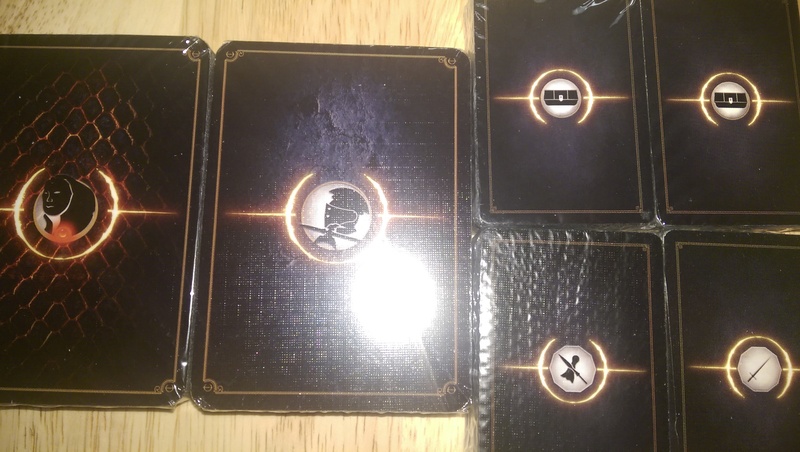 The punches are mostly solid, though I would recommend being careful with the character punch cards, as the backing of my Assassin card ripped while I was punching out the spaces. 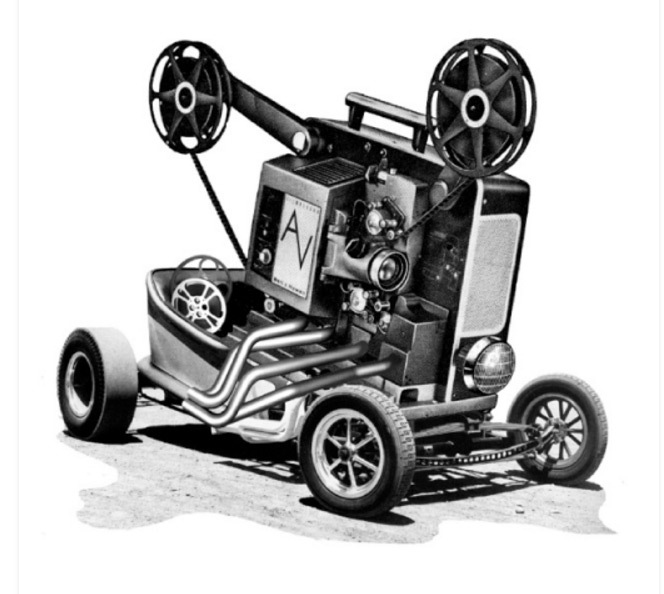 That said, they’re also made of fairly heavy stock, and should otherwise withstand a decent amount of punishment. 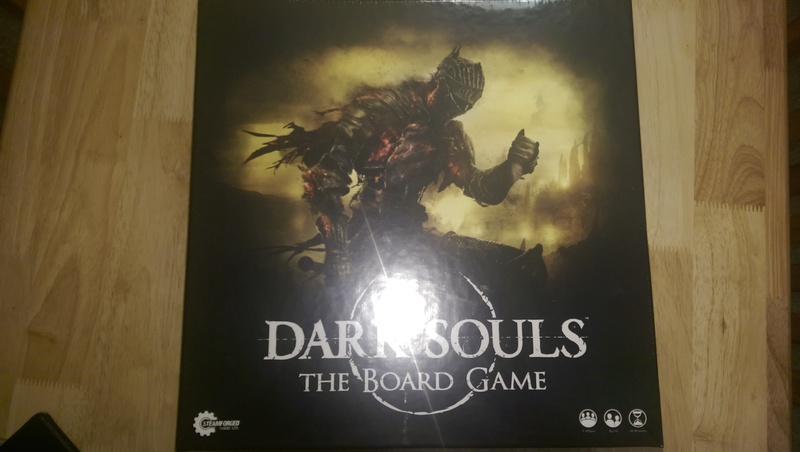 All told, from a pure aesthetic and product value perspective, Dark Souls was well worth the investment, both as a fan of the franchise and a newly minted board gamer. 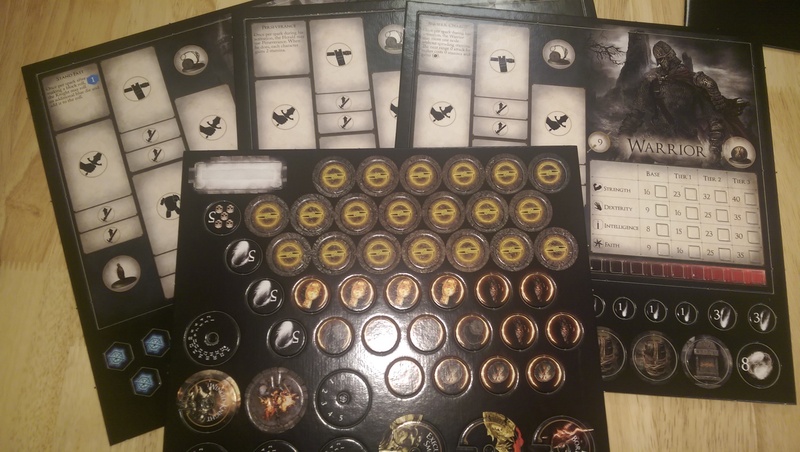 From a fan perspective, the boards, models and cards are definitely designed to evoke fan appreciation, and it’s easy to see that Steamforged put a hell of a lot of effort into making the models and aesthetics match up to what fans would expect. From a board gaming perspective, the game looks to be appropriately complex and hardy, and seems like it’s going to be an interesting experience once I’ve had a chance to sit down and really put it through its paces. While the game is likely going to take some time before it makes its way into general production, it’s definitely one you’ll want to keep an eye on as it comes closer to release, as it’s definitely looking like a winner so far. Once I’ve had a chance to give it a run through, I’ll be back to give a more comprehensive view on how the game works and what to expect once it’s available in your local retailer.